This dazzling showcase of the art of inlay provides artistic inspiration as well as how-to instruction and design insights--written by the inlay artist for U2, Led Zeppelin, and many more. Over 100 color photographs show you exquisite inlays in musical instruments, wooden boxes, and various objets d'art, while black-and-white photos and drawings guide you through the intricate process of creating your own. 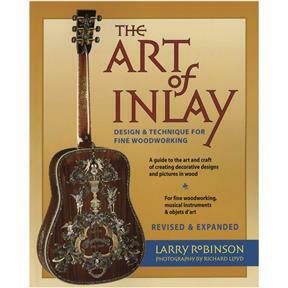 The book has been revised and expanded throughout, including an additional 16-page gallery of wonderfully creative inlay examples, as well as new techniques developed by the author. This book is both a celebration of this woodworking art and a hands-on guide to its design, techniques, tools, and unusual materials.